Today’s agile organizations pose operations teams with a tremendous challenge: to deploy new releases to production immediately after development and testing is completed. To ensure that applications are deployed successfully, an automatic and transparent process is required. We refer to this process as Zero Touch Deployment™. This white paper reviews two approaches to Zero Touch Deployment—a script-based solution and a release automation platform. The article discusses how each can solve the key technological and organizational challenges faced by agile organizations when they set out to implement an automatic deployment system. Today’s agile organizations pose operations teams with a tremendous challenge: to deploy new releases to production immediately after development and testing is completed. To ensure that applications are deployed successfully, an automatic and transparent process is required. We refer to this process as Zero Touch Deployment™. 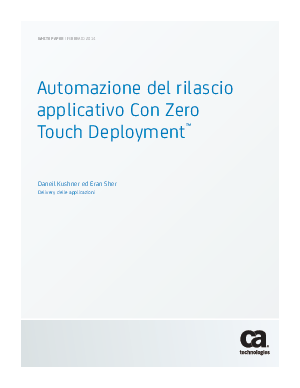 This white paper reviews two approaches to Zero Touch Deployment—a script-based solution and a release automation platform. The article discusses how each can solve the key technological and organizational challenges faced by agile organizations when they set out to implement an automatic deployment system.